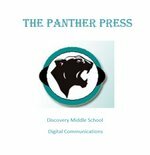 The Digital Communications class at Discovery Middle School publishes school news videos and articles through The Panther Press. Throughout the year special videos of school events will be posted for viewing. Please check back regularly for updated videos!